It always felt strange to celebrate today’s holiday while knowing the violent history of the USA, which resulted in the stolen lives and lands of millions of Native people. This is why our climate justice movement must recognize the leadership of Native people and ensure racial justice at the heart of our work. Got Green supports the struggle led by Indigenous Water Protectors at Standing Rock, North Dakota to defend their water source and ancestoral lands. 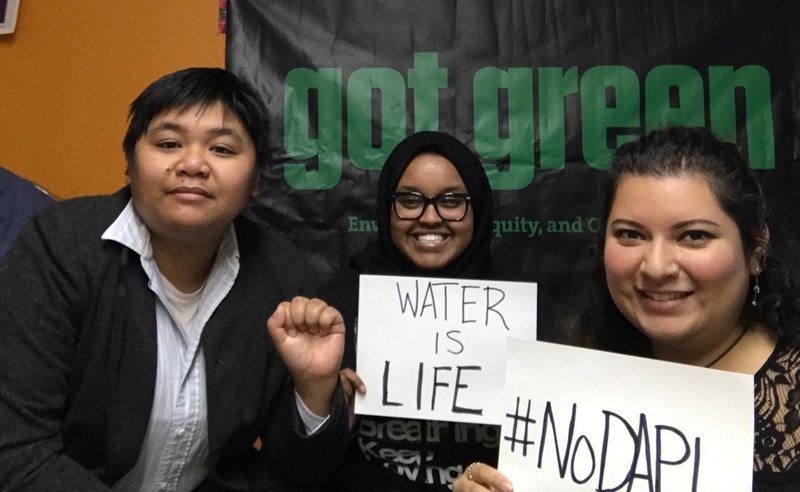 Youth, elders, and women, including Got Green’s Young Leaders and others in Seattle, have joined the national call to action to go to the frontlines to fight for the right to healthy water for generations to come. If completed, the proposed $3.8 billion Dakota Access Pipeline would carry a half a million barrels of oil per day and impact the supply of drinking water and irrigation water that more than 10 million people depend on. * Donate much needed funds and supplies for the Sacred Stone Camp, the Legal Fund for Defenders, and the Oceti Sakowin Camp. * We are also collecting winter camping gear for future delegations to Standing Rock. If you would like to donate your gear, please call us at 206-290-5136 or email info@gotgreen.org. * Educate your community and friends about the real history behind Thanks-taking day.